Jeremiah Sullivan Black was a prominent lawyer, judge, and U.S. attorney general, and also an unsuccessful nominee for the U.S. Supreme Court. Black was born January 10, 1810, in Stony Creek, Pennsylvania. He was raised in rural Pennsylvania and was largely self-educated through his own reading and study of Shakespeare, the Bible, and other works of literature. He originally planned a career in medicine, but his father arranged for him to study law with Chauncey Forward, a prominent local attorney and politician. After three years with Forward, Black was admitted to the Pennsylvania bar, in late 1830. Forward then left his practice to take a seat in the U.S. Congress and turned over his clients to Black, enabling Black to develop a lucrative law practice of his own. Black married Forward's daughter in 1836, and they had two children.Black soon became active in Democratic politics and was appointed deputy attorney general for his county. In 1842 he was appointed judge of the district court, and nine years later, he was elected to the state supreme court. He won reelection to the state high court in 1854, and served as chief justice for three years. While an appellate judge, Black was best known for his opinions defining and construing the meaning of corporate charters. A longtime supporter of President James Buchanan, Black was appointed U.S. attorney general by Buchanan in 1857. While attorney general, Black gained recognition for launching a vigorous prosecution of fraudulent land schemes in California. The investigation, headed by edwin m. stanton, Black's eventual successor, resulted in the U.S. Supreme Court's reversing many district court cases involving land Fraud. Black also enforced federal laws concerning the slave trade and the return of fugitive slaves. In addition, Black helped establish the Buchanan administration's position on secession, urging the president to maintain a strong Unionist stance. In a shuffle of cabinet offices in December 1860, Black served for a short time as Secretary of State. 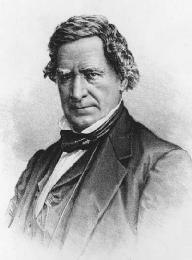 During his brief tenure, South Carolina became the first state to secede from the Union, and Black was a key adviser to Buchanan in handling the crisis. In January 1861, with only a few weeks left in his own term as president, Buchanan named Black to a seat on the U.S. Supreme Court that had been vacant for eight months. Republican senators, anxious to give the incoming president, Abraham Lincoln, his first appointment to the Court, opposed Black. Furthermore, although Black was a strong supporter of the Union, he was not an abolitionist. As a result, his nomination was harshly criticized by the Northern antislavery press and by Democrat stephen a. douglas, who had just lost the election to Lincoln. Also, Southern senators who might have supported Black were resigning from the Senate to join the Confederacy. Had Buchanan acted earlier to fill the seat, Black could have been easily confirmed. Instead, he was rejected 26–25. "Justice travels with a leaden heel, but strikes with an iron hand." Deeply disappointed at his narrow defeat, Black returned to his home in York, Pennsylvania. He then suffered a number of personal setbacks, including the loss of his life savings, which he had entrusted to a relative for investment, and a rapid decline in health. In late 1861, Black's health gradually started to improve and he resumed practicing law. In December of that year, he was appointed reporter of decisions for the U.S. Supreme Court, a position created by Congress in 1816. As reporter, Black was primarily responsible for editing, publishing, and distributing the Court's opinions. The reporter was paid a modest yearly salary and usually earned additional income selling copies of the bound volume in which an important case appeared or printing and selling a significant opinion separately in a pamphlet. In those days, the volumes produced by a particular reporter usually bore the reporter's name on the spine. Black served as reporter for three years and produced Black's Reports, two volumes of opinions that earned him high praise. In 1864, Black left the Court and returned to private practice in Pennsylvania. He handled several important cases before the U.S. Supreme Court, including ex parte milligan, 71 U.S. (4 Wall.) 2, 18 L. Ed. 281 (1866). In Milligan, the Court held that the president lacked the power to authorize military tribunals to try civilians when they could be tried in civil courts. Black also remained involved in the continuing litigation over California land titles, and earned high fees for his services. Black was a close friend of President Andrew Johnson, who assumed the presidency after Lincoln was assassinated. Black was initially engaged to represent Johnson in his Impeachment trial but withdrew after disagreements with Johnson's other lawyers arose. He also served as counsel to samuel j. tilden, an unsuccessful Democratic presidential candidate, in an investigation of the disputed results of the 1876 presidential election. Black continued to practice law and remain active in civic affairs until 1883, when he died at the age of seventy-three.